Solidarity With Migrant Families: Join the February 17th teach-in at the border against Child Detention! The Trump administration’s “zero tolerance” policy of separating migrant children from their families at the boarder is cruel and inhuman. The U.S. government has admitted to separating 2,700 children from their families and a recent Health and Human Services report indicates that there could even be thousands more. This gross injustice has prompted the national … Continue reading Solidarity With Migrant Families: Join the February 17th teach-in at the border against Child Detention! Dear Black Lives Matter at School Family, On behalf of the Black Lives Matter at School Coalition we are writing to thank everyone for a powerful week of action from coast to coast. Because of the bravery and tenacity of many thousands of educators, students, parents, activists, and organizers, BLM@School week was bigger and more … Continue reading Thank You To Everyone Who Made BLM@School A National Success! Black Lives Matter At School week of action begins today. Here’s what you need to know to be ready. Today, Monday, February 4th officially marks the launch of the second annual national Black Lives Matter At School week of action. Supporters will be posting their photos, lesson plans, and stories of the day on social media with the hashtag, #BlackLivesMatterAtSchool. 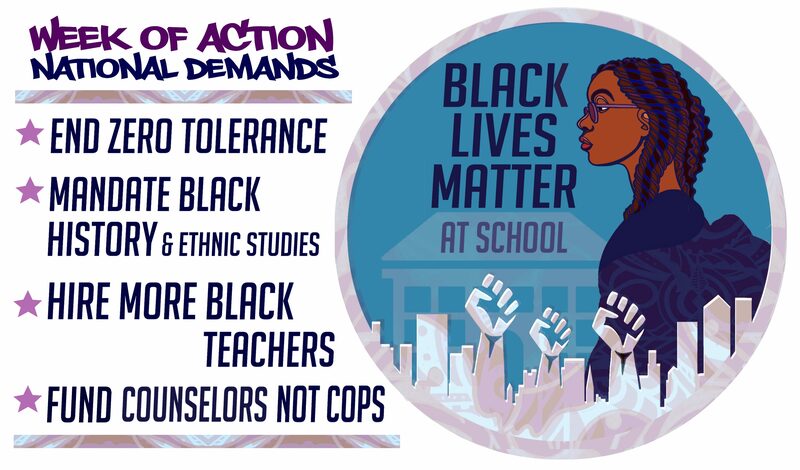 The four demands of the movement are: 1) End “zero tolerance” discipline, and implement … Continue reading Black Lives Matter At School week of action begins today. Here’s what you need to know to be ready. Professors for Black Lives: An outpouring of support for BLM@School week in higher education! Citing the need to "promote equity; the value of human life; and educational, political, and social justice," scores of professors from institutions of higher education from around the country have signed on to petition of support for Black Lives Matter At School Week. The Black Lives Matter At School coalition encourages all college and university … Continue reading Professors for Black Lives: An outpouring of support for BLM@School week in higher education!